In the wake of the Christchurch tragedy, it seems certain New Zealand will follow Australia in implementing further gun control by banning automatic and semi-automatic firearms. Like it was for Australia in 1996, this issue is highly contentious for our Kiwi cousins and has reignited debate here and around the world. The similarities are glaring. One major and devastating massacre resulting in an enormous cost of human life. Both carried out by one lone, mentally unhinged gunman. Like John Howard, Jacinda Ardern was quick to announce imposing restrictions to the accessibility of semi-automatic weapons. In both countries, the assailants had purchased the weapons legally. Howard and Ardern each reacted quickly, strongly, seemingly without concern for reprisal from their citizens. Cue the Internet wars of the gun control debate. Also, cue media spin from the NRA and, as we now know thanks to the exposé by Al Jazeera, our very own Pauline Hanson’s One Nation Political Party. Due to massive cultural differences in acceptance of guns and gun violence, it is almost impossible to compare the United States to Australia in terms of gun control efficacy. That is, unless you are One Nation Senior Members Steve Dickson and James Ashby. 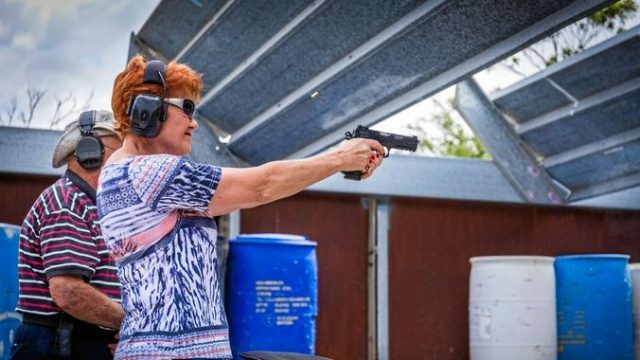 Now widely published, Dickson and Ashby met in Washington with the National Rifle Association in a failed bid to secure $20m for the One Nation Party. Their ultimate objective was to gain seats in the Senate with a promise of agenda to wind-back our gun control legislation. Our gun control works and we don’t need advice, help or financial support (illegal as it is) from the NRA. So sit down One Nation. You’re drunk. The temptation to invest in paragraphs addressing the misleading politics of One Nation claiming to support gun reform publicly and then doing this underhanded little NRA shifty is strong. Very strong. However, more important is that for once and for all, we address the rampant misinformation that has fed pro-gun lobbyists both in Australia and in the United States, about Australian gun control. In the US where some States have adopted gun control, the NRA and advocates “against”, use statistics to show that states where gun control is strongest, have the highest gun violence. It’s a reasonable argument until you understand why that has occurred. US gun control has failed in no small part because they’ve been unable to write effective legislation and have apparently limited willingness to enact or police it. When you scrutinise their legislation, it’s almost as if they wrote it to fail. Pardon my sarcasm but, who knew? Tragically, their second amendment rights to “bear arms” seem set to always be protected. As a result, it seems the US will always have a significant and disproportionate problem with gun violence. At the moment, recorded gun deaths in the US stands at twelve times that of Australia. Firearm legislation in Australia is considered “restrictive”. It is not a total ban on firearms. You can own a shotgun or pistol in Australia if you have a use for it, such as farmers, recreational shooters or hunters. There are strict conditions for gun ownership including locked storage, licensing, and being trained in safely storing, carrying and discharging a weapon. Australia keeps a record of licensed and registered gun owners and has strict legislation around gun ownership that is policed and prosecuted when necessary. We have mandatory medical reporting of gun owners for when they are at risk of self harm, or harming others. The mental health policy for acquiring a gun is strict and adhered to. Those with a restraining order against them or criminal history in the past ten years are prohibited from owning a gun. Prior to the Port Arthur massacre, Australia had an average of 500-600 gun deaths per year. We currently have the lowest gun related death rate in our history with 238 gun deaths recorded in 2016. To argue that Australians are somehow disadvantaged by its gun control legislation is nonsensical. Shooters still shoot, farmers can still put down livestock, hunters can still hunt. The rest of us can go about our lives knowing that the vast majority of people we encounter are not carrying a firearm. We do not live in fear, nor do we have an irrational fear of a tyrannical government. And most importantly, our children do not have to be educated on the practical nature of surviving a mass shooting. Prior to the Port Arthur Massacre, Australia was on a per capita trajectory to equal gun deaths in the United States. Today, gun deaths in Australia per 100,000 of population = 1. To say the NRA is powerful is an understatement. The majority of American people still love their guns and it’s widely acknowledged the NRA backing of Trump is what won him the election. However, some states have been able to get gun control legislation enacted in recent years. Because it is very limited in its efficacy it is widely heralded as a failure by gun lobbyists. Here is where their legislation fails. You can still legally purchase a fully automatic firearm in some states and semi-automatic weapons are granted without a permit in most jurisdictions. Purchasers from a gun store must provide a background check. Private purchasers of firearms are not required to provide a background check. Thus, this creates an easy market for approved persons to trade to an unapproved person. The United States does not keep a record of licensed gun owners. Where domestic violence or apprehended violence is a concern, legislation exists to have those firearms seized. However, if no record of gun owners is kept, this relies on voluntary admission of gun possession. The most basic of logic applied here can see this is ineffective. The mental health and gun ownership policy in America is particularly lax. For owners or dealers, the only restriction on mental health appears to be for those who have been involuntarily admitted to a mental health facility within the past twelve months. This means anyone with a mental health condition, including those who have voluntarily been committed, may own a firearm or a dealership. It’s not hard to see they never really wanted this to work. When Americans argue that gun control fails they are looking only at the efficacy of lax gun laws, limited policing and zero record keeping. Gun deaths in America per 100,000 of population = 12. Although slightly higher than Australia, New Zealand currently has a relatively low rate of gun violence. However, it wasn’t always that way. In 1990 there was a mass shooting of 13 people and their government enacted amendments in response. Since 1990, deaths by gun violence in New Zealand have dropped by two-thirds. The fundamental difference between Australia and New Zealand has been the licensing of semi-automatic weapons in New Zealand, as legally obtained and used in Christchurch. Since the shooter in Christchurch had legally obtained a weapon through licensing, the only logical answer is to ban them from being sold or owned or imported. It will not make it impossible to acquire a semi-automatic in New Zealand, but it will make it much harder. Especially for a small (but border secure) nation such as they are. Had it been significantly harder for the Christchurch assailant, he most likely would have chosen elsewhere. Sadly, he was hell-bent on destruction and so that devastation would still most likely have occurred somewhere. However, now they aware of the fault in their laws, New Zealand is compelled to act swiftly and Jacinda Ardern is justified in her actions. Prior to the Port Arthur massacre, Australia had an average of 500-600 gun deaths per year. We currently have the lowest gun related death rate in our history. As uncomfortable as it is, we must accept that we now live in an age of terrorism on our previously safe shores. We all want to be safe and protected as much as possible. Terrorists will use many forms of weapons in order to instil fear into a populace. Bombs, vehicles and guns and machetes are at the fore. Gun control is one measure which helps to keep us secure. It’s not everything, but it’s something, and it’s necessary. For the United States, it’s possibly too late for effective gun control. It would take generations to change their culture and at this point in time, gun violence is a significant problem. In the past 20 years, their rate of gun deaths has increased two points and will most likely continue to rise. They can hardly hold themselves as the litmus test for the efficacy of gun control. At least until they make a genuine attempt to effectively legislate. Gun control works when firearm legislation is strong and has the capacity to be effectively policed. It works when political leadership is strong and has the backing of its people. Gun control is not about restricting civil liberties, but about protecting them. Comparison and citations source: www.gunpolicy.org.